AlpinePure ET replacement filter pads for your AlpinePure ET air cleaners. Quantity discounts on AlpinePure ET replacement filter pads. 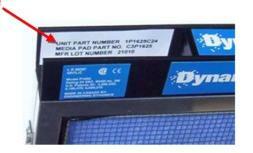 AlpinePure ET air cleaners are manufactured by Dynamic AQS. Here is the Dynamic air cleaner owners manual. All Electro Breeze air cleaner pads are made from verified materials tested and designed especially for polarized media air cleaners including the AlpinePure ET air cleaners. AlpinePure ET air cleaner. Click here to see our comparisons.